Vacation rental condominium. Sleeps 6, 2 bedrooms, 1 bathroom. No pets allowed. This private deck offers a view of the harbor. Welcome to the Elwha Suite - what a view! A view of the east side of the building that looks out to the ferry landing. If you enjoy watching the hustle and bustle the balcony will be your perfect perch. What a great setting for a nice meal or game of cards! The living area is tastefully furnished and welcoming. The kitchen is fully equipped, spacious and includes a dishwasher. Both bedrooms offer a queen size bed. RIGHT IN THE HEART OF FRIDAY HARBOR ON SAN JUAN ISLAND. Absolutely delightful Ferry Landing Suite with two bedrooms, deck, parking. 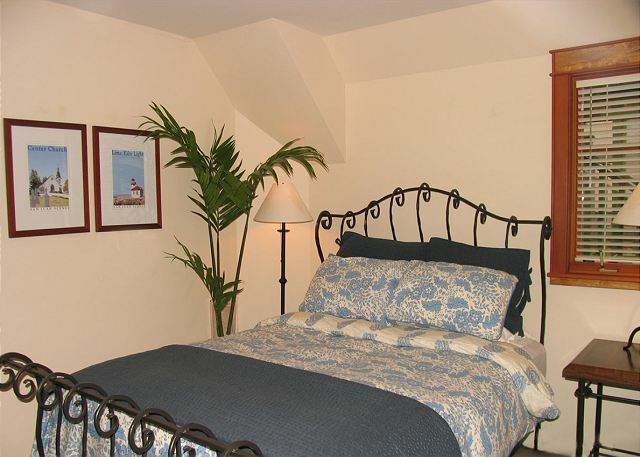 You will feel like you’re living in a postcard when you stay at The Ferry Landing Suites! 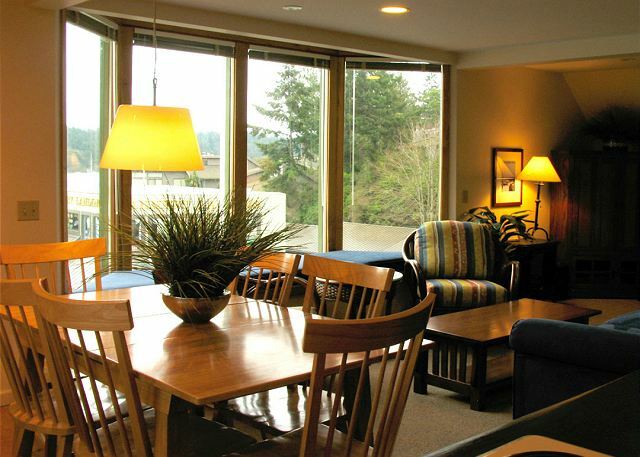 The Elwha Suite is a delightful two bedroom condo located on the center level of a landmark building just a few steps from the heart of historic Friday Harbor. There is no accommodation more convenient for walking from the ferry landing or seaplane dock should you choose to leave the car behind on the mainland. When you do bring the car, there’s a coveted on-site parking space reserved just for you. 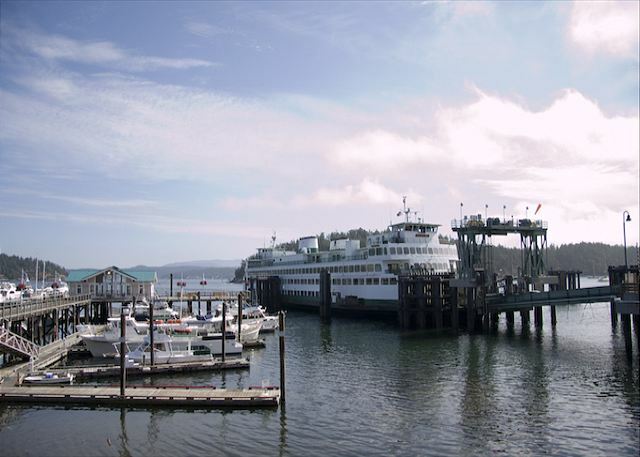 You will find all the attractions and activities that Friday Harbor has to offer within a short stroll, including whale watching excursions, kayak adventures, local shops, fine galleries, theater, and an eclectic selection of restaurants. As an added bonus, there’s a coffee shop on the lower level where you can sip your morning latte, enjoy fresh baked goods, or enjoy a fresh fruit smoothie. During the summer, perch up on your balcony above the bustling street to enjoying watching the ferries glide in and out of the harbor. During the fall and winter months, you will find the Yakima a wonderful place to snuggle up indoors and enjoy the quiet, reflective atmosphere cherished by the locals. The Elwha Suite is beautifully furnished, featuring two equal bedrooms, both with king-sized beds. The living area is spacious offering a sleeper sofa, full kitchen, and dining table. A perfect choice for two couples or small family. Interim cleaning is available on request. Northwest Island Escapes makes every effort to provide, and provide timely maintenance and service for, all the amenities listed in this property description. However, at times, due to events out of our control, these services may not be as fast or reliable as our guests are used to on the mainland. Please Read your contract for important additional information about the availability of these services. WIFI service is POOR at this location and is not guaranteed. The location is perfect immediately in front of the ferry. Beautiful windows where we sat and watched the busy activity of the port. Close to all restaurants. Reserved parking. Very clean and comfy robes were a great touch. The only issue we had is the internet was inoperable for the entire trip and was never repaired even after reporting the issue. Amazing location. You look out your window at the ferry dock just below you. For us non-islanders it feels like being at the heart of the activity while still at home. And you have two coffee places and 3 restaurants within 100 feet of your door, but you're also a couple floors up, so it's not off-putting, quiet and private. The only disappointment in our stay was that the wireless was down the whole time, Friday to Tuesday. There had been a problem throughout the island the day before with a cable cut at Anacortes, but as our stay wore on, everybody else had Internet, we didn't. Management became responsive only after several complaints, and the problem was still there when we left. Clean, well maintained. However wifi nor AC worked. This property is all about the location. Literally steps from the ferry landing, you're in the middle of it all with the best views of the harbor. Furniture is dated and not the most comfortable (the new blue couch is awful), but certainly doable. Has all the basic kitchenware you need for simple meals. Fabulous location & very comfortable. The Elwha Suite was perfect. It’s on a great location and the visual experience was breathtaking. Friday Harbor is beautiful during the evening hours and everyone is extremely friendly! You just can't get more convenient than this condo. It is right off of the ferry, right downtown. The balcony is our favorite place to sit and play cards and watch people come and go on the fairies. There is a bakery and coffee shop right below. Unfortunately, the baker enjoys loud music early in the morning... we switched rooms with the children and that seemed to work :-) We love this location and will definitely be back again. First time to visit San Juan island. Traveled with a one year old... very clean unit. Across the street from the Ferry. Super convenient, close to restaurants and lots of interesting people watching. Overlooks the water, enjoyed it very much. Not secluded but a great unit for convenience. Up a flight of stairs so need to be mobile. Easy, no hassle access to the unit. VERY close to the ferry dock, easy access to the cafe downstairs, ideal in-town location. 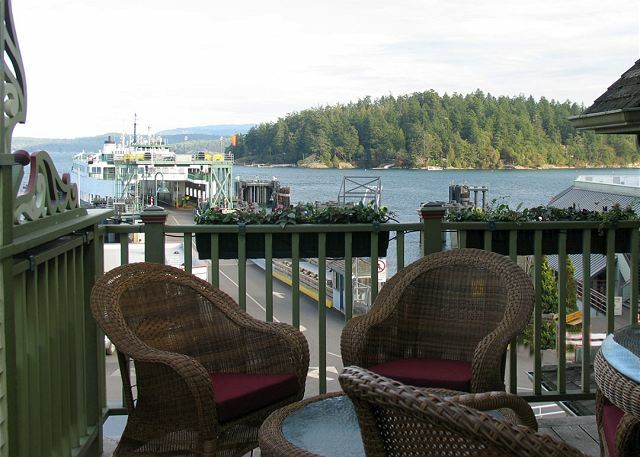 The Ferry Landing Suites is the best location on the island, in the heart of Friday Harbor. We never tire of watching the passing parade of tourists, locals, delivery trucks and ferries right out the bay windows. We needed a place close to the ferry without breaking the budget. This place was perfect. The view was amazing and it was clean, updated and spacious. Highly recommend. Loved this place! The only annoying thing that happened was an employee from the resturaunt next door kept using our parking spot. After parking our car in Anacortes, we took our bikes on the ferry to Friday Harbor. Rolling off the ferry and right up to our condo, was a luxury! The Elwha suite has the best view, and is located in the heart of Friday Harbor. My two children enjoyed watching the fairies come and go. We played games out on the deck, wow people watching all the tourists. We visited the ice cream shop across the street several times. Each day we did a different bike ride, each day a new adventure, each day returning to our comfortable and convenient lodgings. We felt a bit special staying in this perfect locale. We will definitely be back! Sweet stay in "Elwha Suite"
Five sisters 59to73yrs loved our stay. We could walk everywhere in town & had our own parking spot guaranteed if we took the car out. The restaurants around us closed early enough for night sleeping but close the windows if you don't want 4:30am Ferry vehicle line up to keep you awake. Great location & plenty of action to watch from 2nd story bay windows. We liked The Far North Café for quick breakfast & espresso coffee drinks. Superb. All that I hoped for. Thank you. Great people watching in heart of town. We had a great time. The downside is early morning noise from ferry loading. Overall very good but pricey. Also, only has one bathroom which was a bit troublesome for five guests. We really enjoyed our stay. Great location and lots to see. I was not too impressed with the cleanliness of the bathroom. Mostly the shower. There was orange mold on the walls and black mold on the floor. I feel like if you are going to charge as much as you did for the rental you better make sure it's in tip top shape. Also the beds were very hard as were the pillows. Oh also you should let renters know that they can store their luggage in the property office. Thanks to John we were able to do that. Great balcony and liked the layout. The mattress and sheets are of poor quality. There were 5 of us travelling together and we all loved the Elwha Suite! The decor was great, 2 nice sized bedrooms, a big bathroom, spacious living and kitchen area. Lots of light and windows. And the views - GREAT! We were lucky and had nice cool to warm, sunny weather. We all enjoyed spending time watching the ferries and all the hustle and bustle of Friday Harbor. The bathroom was well stocked with plenty of soap, shampoo, and towels. My only suggestion to the owners is the kitchen really needs more pots, pan, dishes, and silverware. But, I really can't express how much we all loved this place. None of us wanted to leave. There is no doubt we would stay here again and highly recommend it to anyone. I go to Friday Harbor yearly. I have typically stayed at a bed and breakfast place or one of the hotels. Since 3 of us were traveling together this time, I booked the 2 bedroom condo with a view and was very happy. The condo is so conveniently located and the private balcony was just what we needed after a long day of running around everywhere. Sipping wine, watching the ferries and just enjoying the view with friends. We had a great weekend escape. We loved the location. Our two boys, ages 10 & 7 enjoyed waking early and car/bird watching from the wonderful window seat in the Living area. Everything was perfect, minus 2 minor complaints. 1st - we would really love to see more gourmet cooking/baking equipment (there wasn't even a skillet, just 3 Teflon coated pots - and we prefer stainless uncoated). 2nd - our in-laws were upstairs from us, and wake several hours earlier than us, unfortunately the upstairs bathroom is set right above the bedroom we slept in. We heard every flush. We wouldn't let that deter us from future visits though, because we can expect a change in architectural layout. :-) It was a fantastic stay, and we felt very at home, but with less obligation and much more fun! Also, the proximity to everything shopping and eating is so perfect! Terrific Sushi and Thai right out the door! We really enjoyed our stay at The Elwha Suite in Friday Harbor. We have been here a few times and always like to return. It is comfortable with a great view in the center of town. What a surprise! This was the perfect setting for making memories with family. The room was perfect. The view from the private deck was incredible. Perfect collection of furniture to make various arrangements for gathering. Summer rates would probably be too expensive for us. Off season rates were affordable. This two bedroom condo is fabulous. Wonderful views directly across from Friday Harbor. Nicely decorated property and nice amenities. We were definitely impressed. Will certainly stay here again on future trips! We (two couples) had a very nice time at this property which was so convenient to everything. It was a very warm weekend and they had fans for each bedroom which was nice. The property could use screens on the windows so you could have more ventilation. What a perfect place to stay in Friday Harbor! We walked right off of the fairy, walked one block and we were here. The place is magical. We especially loved the gorgeous private outdoor patio where you can enjoy a bottle of wine and watch the Sea Planes land. One thing that isn't merchandised too well in the photos is the gorgeous bay window that looks out onto the harbor. The perfect place to enjoy some morning coffee from the coffee shop right downstairs. 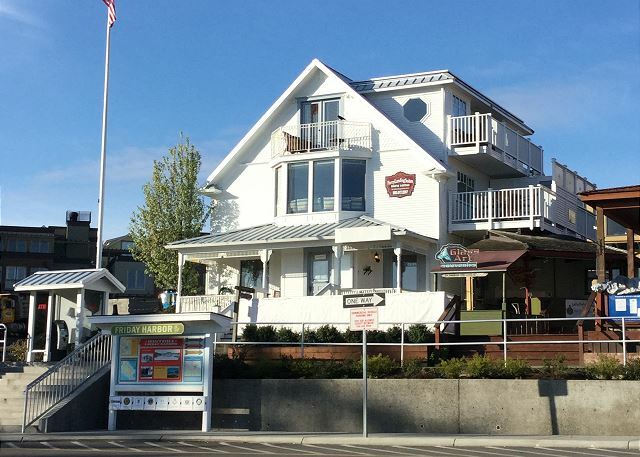 You may be able to spend a little less and stay at hotel a half a mile away, but trust me - spend the extra money and enjoy the perfect place in Friday Harbor! We rented both the apartments in this building: the 2nd floor with 2 bedrooms for my parents and sister and the 3rd floor studio for my husband, daughter and me. It was perfect! We had all the space we needed with privacy for everyone and the convenience of being all together. Linda, the rental agent was wonderfully helpful both before and during our stay. The apartments were clean and well appointed - just as described in the listing. The beds were very comfortable - even the sleeper sofa in the 3rd floor apartment. There were plenty of towels available in the bathroom and most everything we needed in the kitchen. We could have used a couple more bowls for breakfast and/or for snacks on the 3rd floor. The other additions that would be helpful would be a blanket for the sleeper sofa and recycling containers. We left our recycling bagged and in the apartment when we left because we didn't have any other place for it. We loved the location in the middle of everything. We watched the ferry loading and unloading and all of the boats coming and going. I was concerned that it might be noisy but it wasn't. When the ferry was loading there was some noise for a brief period but not disturbing. We loved being able to walk to the apartment from our boat coming in and then walk to shops, restaurants and the whale museum in town... then we were right there to get to the dock for a wonderful whale watch! There are other properties that would be better if you are looking for away and secluded. This is in the harbor area - and fun! The apartments were wonderful rented together for our group of 6 people but would also be great rented separately for fewer people. The 2 bedroom 2nd floor apartment certainly has more space and the fully appointed kitchen but the 3rd floor apartment is also lovely and was very comfortable for 2 adults and our 19 year old daughter. We are looking forward to staying there again! We've stayed there twice before, so obviously, we like it. Dining table was broken, as was one chair, and another was wobbly. Under-sink cabinet door needs hinge replacement. Shower handle needs tightening. 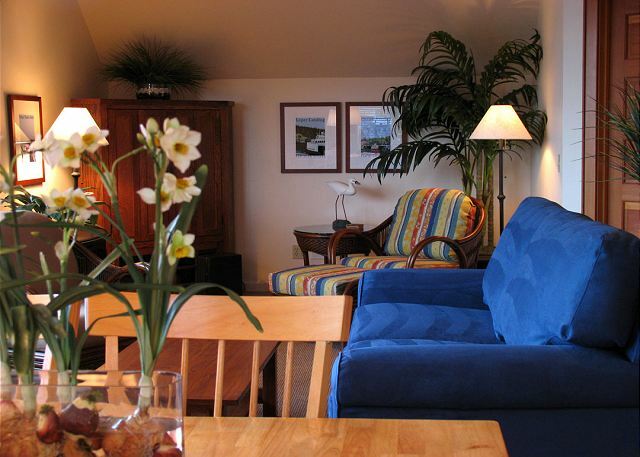 Two couples stayed three nights in the Elwha Suite of the Ferry Landing Suites. The view from the from window and the private deck were of the ferry landing. As such we saw all the action as ferries arrived and left throughout the day and evening. The suite was very clean and comfortable. Restaurants and shops were steps away. Our only issue was with a lack of clean towels. Excellent location near the ferry. The private patio was a favorite hangout in the mornings and evenings. Efficient and pleasant, the rental company made this a very easy experience. As noted in other reviews, it is a loud and active location, with daily ferry noises, trash trucks, semi trucks, and even one morning at 0600 the street cleaner. Best for early risers! We enjoyed our stay in Friday Harbor and were happy to stay so close to everything. Three of us shared this wonderful apartment and loved being so close to everything! It couldn't have been more conveniently located. The deck was a great place to enjoy a morning coffee and muffin(from right downstairs) or an afternoon glass of wine, while watching the world go by. The rooms were very comfortable, except for the fact there were few opening windows with screens, which would not have been a problem, if we had not been there during a "heat wave". Rooms were stuffy during the day and did not cool off until late in the evening. Despite that, we'd definitely stay there again. We also rented a car and toured the rest of the island which I highly recommend. Roche Harbor is small, but delightful, and the drive provides lots of opportunity for scenic stops, as well as a lavender farm, alpaca farm, and winery. My family of 5 had a great stay in the Elwha Suite. We enjoyed watching the ships, cars, and people come and go. Staying right in the heart of the action gave us a great vibe for the town. 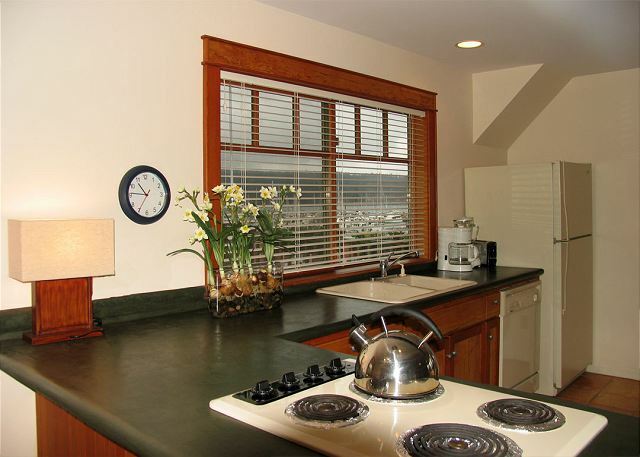 The location is convenient to everything you need for a visit to Friday Harbor and San Juan Island! It is a bit noisy in the mornings, but we decided it was worth it to be right downtown! The location, view and accommodations were all wonderful!!! Part of the fun staying here is watching everything going on around you, especially the ferries coming and going. The only thing I would say is if you want it quiet this isn't the place for you. But if you like action, beautiful views, walking distance to just about anything this is a great place to stay! Best location in town for sweeping views of the harbor. Close to everything. Full kitchen with all the basics. Awesome window seat overlooking the ferry landing. Great outdoor deck space. Our favorite place to stay in town. Beds aren't the most comfortable, but everything else more than makes up for it. Elwha Suite is furnished for comfort. Everything you need is provided, and the location is ideal for anyone travelling without a car. The large front window of the suite is perfect for watching the ferries come and go. Wonderful for a rainy day. Ferry Landing Suites are close to all the shops. And with a coffee shop on the ground floor of the house, there's always somewhere close to eat. Great view of the ferry and Friday Harbor, I loved its location in the heart of town. The suite is very attractive, comfortable, clean and well-kept. If you plan on being organized and initiating your own check-in arrangements and don't rely on the management to take care of everything for you, your stay will probably begin much more smoothly than ours. The room is so wonderful though, I would absolutely stay there again. We are VERY sorry about the difficulty you experienced with your check-in instructions. Your stay coincided with a most unusual event - the underwater fiber optic cable connecting the San Juan Islands to "the world" was severed, resulting in no telephone, internet, or cell phone communications for a several days. (Wow - do we all depend on them to do any business!) Services were gradually and intermittently returned through a variety of emergency repairs and utilities, but unfortunately the situation impacted our ability to provide directions and customary guest information for a period of time. Glad that you enjoyed your stay in other respects! We originally had reserved the Yakima room, but because of water damage we were upgraded to the Elwha suite. We didn't need the extra bedroom, but I was very pleased with the suite. It has a bay window, complete with cushions, looking right at the ferry landing. What a beautiful view. A great place to sit and have coffee in the a.m., and even better place to sit with a glass of wine in the p.m.. Also it had a small patio which was awesome to go out and have dinner. I would recommend this rental to anyone staying in Friday Harbor. It doesn't get any better than that!!!!! Everything from the reservation process to the actual accomodations in Friday Harbor was excellent. We cannot wait to come back again! We had relaxing stay with a great view in this conveniently located condo. We enjoyed watching the ferries come and go and loved being able to walk to everything in Friday Harbor. The rental is very nicely furnished and very clean. Elwha Suites = Exquisite, thank you ! Location, location, location = perfection ! It couldn't be a more fun place to stay that is even more valuable with its full kitchen you can chow down on the stylish wicker chair/table private deck overlooking all the fabulous activity. Every seafood cafe and restaurant we went to was terrible, so I'd recommend bringing your own food. Friday Harbor needs to improve on their eateries which was a costly disappointment. The dining at Roche Harbor on the other hand IS Fabulous... Also, the property management people for Elwha are wonderful - Thank you for everything ! The convenience as well as it's a cute place with the most excellent location makes The Elwha the very best choice with two bedrooms... FANTASTIC! a guest from Palmdale, CA does not recommend this vacation rental. My first time at this location and I must say, it was nice. The unit had a beautiful view with comfortable interior. I'm not much of a morning person, so the coffee below (that prepped for opening around 6am) was not working in my favor. There was a small spider problem, but no biggie. May be more of a concerned to those traveling with children. I always have a great time visiting friends and family in Friday Harbor and I'll return soon, for sure. I'll definitely recommend this place to others (I actually did so, during my visit). I may not recommend it to friends of mine, though.. We all work long hours and wake up pretty early in the daily grind, so we enjoy having the option to sleep in a bit while on holiday. Once again, "Great place for the Early Bird". There were no check out instructions. We didn't know if they wanted the beds stripped, lights on or off etc. A very minor concern but it would have been helpful. The photos and description do not do this place justice. There is a private and locked deck where we stored bikes, the view is phenomenal. There is no street noise which was shocking given how close to the ferry it is. The only 2 issues were that the cookware was scant making it hard to make dinner, and the kitchen noise from the cafe below was quite loud in the one bedroom--early in the morning.